2 CALCULATIONS: rules 1. A formula must always begin with an equal sign (they will also work with a + or – sign but an equal sign is preferred). As soon as you begin a cell with a = Excel will know that you are creating a formula. 4 CALCULATIONS: rules 3. 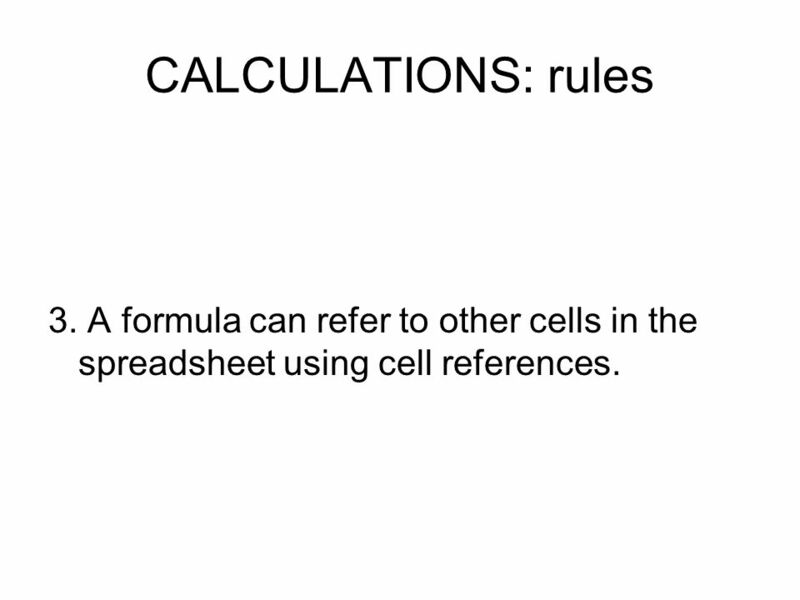 A formula can refer to other cells in the spreadsheet using cell references. 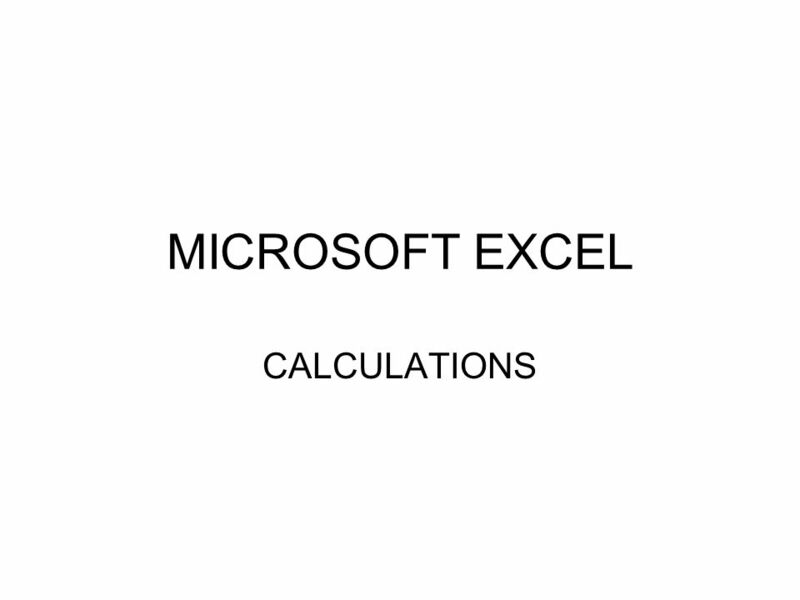 Download ppt "MICROSOFT EXCEL CALCULATIONS." Let’s Learn About Spreadsheets Start What is a Spreadsheet? A spreadsheet is used for storing information and data. Calculations can be performed on. 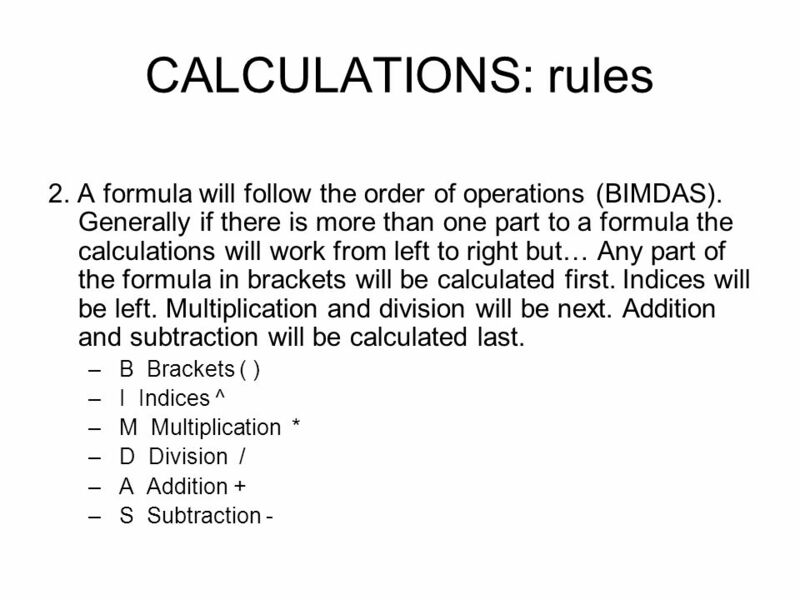 Intermediate Formulas & Functions Instructor: Rachel Baltus. Formulae S S T : S P R E A D S H E E T S SST 4 Spreadsheet 4 Formula. FORMULAS & FUNCTIONS EXCEL 2. Excel Input – a collection of informational data typed into the spreadsheet Output – worksheet results Information to be. INF1060 spreadsheets. Making formulas Like your calculator, you can use Excel to perform many mathematical functions as well as organize data In this. Capital Budgeting and Financial Planning Course Instructor: M.Jibran Sheikh. Microsoft Office Grade 10 A / B Cahaya Bangsa Classical School (C) 2010 Digital Media Production Facility 12 Microsoft Excel – 03. FORMULAS & FUNCTIONS EXCEL. Input A collection of information Data typed into the spreadsheet Output Worksheet Results. Objective: Students will be able to write and solve two- step equations with one variable! Excel – Study Guide #2. Introduction to Using Microsoft Excel and Spreadsheets Click to continue. Excel Using Formulas and Functions Microsoft Office 2010 Fundamentals 1. Excel Garry Storer IT Training Co-Ordinator IT Services. 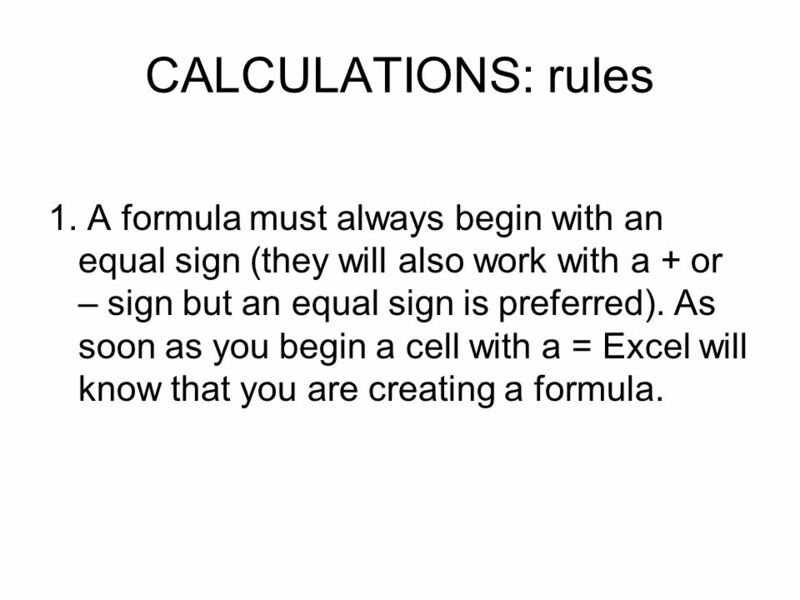 1 Excel Lesson 3 Using Formulas and Functions Microsoft Office 2010 Fundamentals Story / Walls. Microsoft Excel Online Learning. What is Excel? Microsoft PowerPoint is for Presentations Microsoft Word is for Text, Writing, and Typing Papers Microsoft. Spreadsheet revision By Charlotte Neal. Spreadsheet oA Spreadsheet is a computer program that works like a paper worksheet. You can put words and numbers. ALGEBRA REVIEW QUESTIONS. = balance = It is important to understand that every equation is a balancing situation. Everything on the left of the equal.